Consumer reports compared the latest compact crossovers from Mazda and Toyota. Which do you think Consumer Reports chose, the CX-5 with the new engine, or the all-new RAV4? We break it down in detail. When Mazda updated its crossover line-up last year with the 2013 CX-5 it appeared it may overtake the RAV4 as the sporty, fun to drive choice in the segment. Mazda came at Toyota with a fresh design and the chassis was designed for driving crispness and a sporty feel. However, the Mazda CX-5 had one major problem. The Engineers went way too far with their Skyactive treatment and when we test drove it, the vehicle felt very, very slow. The 2.0 liter, 4-cylinder engine with only 155 hp was not up to the task. That has changed and as we explain below, Consumer Reports had an interesting take on the new vehicle. Toyota for its part completely redesigned the RAV4 for this model year and it offered the fresh new look and sporty ride like the CX-5 does, but it too is held back by its four cylinder engine that produces 176 horsepower. The vehicle is so close to being fun, but all the reviews point out the old RAV4 had more than enough power with the 6 cylinder, dropped in the redesign, and was just a little shy with the 4-cylinder that it now offers as the only engine. Mazda has upped the ante in its new 2014 CX-5. It now matches the RAV4 for displacement, at 2.5 liters and the horsepower is a bit more than the Toyota at 184. The engine has a more torque, and that torque comes a little lower in the rev band, which is a good thing. Dimensionally and in terms of weight, the vehicles are nearly identical. The Mazda is just a tad lighter than the RAV4 and it has the wheels pushed out to the edges more, having a 2 inch longer wheelbase and slightly wider track. Both have enough ground clearance for dirt roads, but the Mazda claims 8.5 inches and Toyota claims 6.3 inches. If that is an important factor for you, you may be shopping in the wrong class of vehicle. 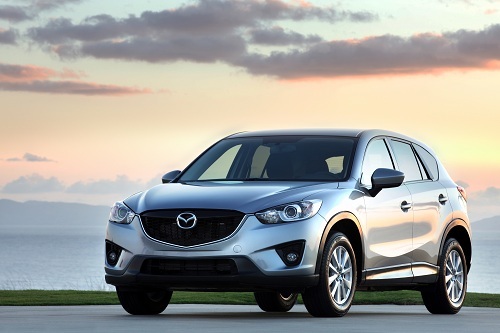 The Mazda CX-5 also has slightly better fuel economy. The AWD drive version of the CX-5 with the larger 2.5 liter engine is rated at an EPA estimated 24/30 MPG City / Highway. The RAV is no slouch, but it has a lower rating of 22/29 MPG. The Mazda CX-5 also offers optional crash mitigation in the form of its “Smart City Brake Support.” Like other similar systems in the market, it helps brake the car at low speeds if something is in its path and the driver does not react. In terms of safety, the RAV4 does have one feature available that the Mazda CX-5 does not offer and that is cross traffic alert. Anyone who has backed out of a space with mini-vans or brute ‘utes on each side knows that it is hard to see if a car is shooting down that parking lot lane. Cross traffic helps a driver know what is coming and back out more safely. This feature will soon be commonplace on all crossovers, but Mazda has not added it yet. Consumer reports tested the 2013 RAV4 and the 2014 CX-5 and they picked the CX-5. It was very close. Jake Fisher, director, Consumer Reports Auto Test Center pointed out that “The good news for consumers is that the Small SUV category is a very tight and competitive race with a number of solid vehicles to choose from.” CR now ranks the RAV4 behind the practical Honda CRV and the fun Mazda CX-5. Torque News hopes to perform a back-to-back short test of the CX-5 and RAV4 next month. We will report the results as an update to this story then.